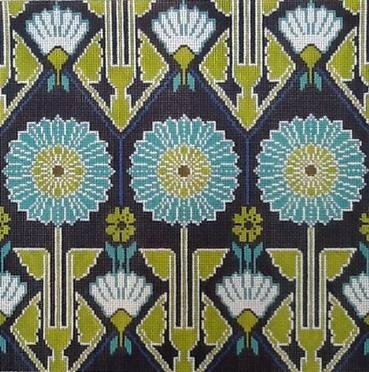 A contemporary needlepoint design by Cooper Oaks that in colors of aqua, navy and lime. What a stunning sofa pillow this would make. The canvas can be sold alone or with threads. If you want threads choose threads from the drop down menu. For cotton we provide DMC floss; for and wool and silks we provide Planet Earth fibers which are single stranded and easy to use. This contemporary needlepoint design is suitable for an advanced beginner stitcher. This needlepoint usually ships within 10 days.